We created [storefront] Olson Kundig Architects as an experimental work place for our firm’s community collaborations, pro-bono design work, philanthropic and volunteer work, and for design research and the development of design ideas. The idea to have our [storefront] space become the Record Store occurred when Sandra Jackson-Dumont (Seattle Art Museum’s Kayla Skinner Deputy Director for Education + Public Programs/Adjunct Curator, Modern and Contemporary Art) visited our office to speak about her background and her practice as part of our bi-monthly lecture series. 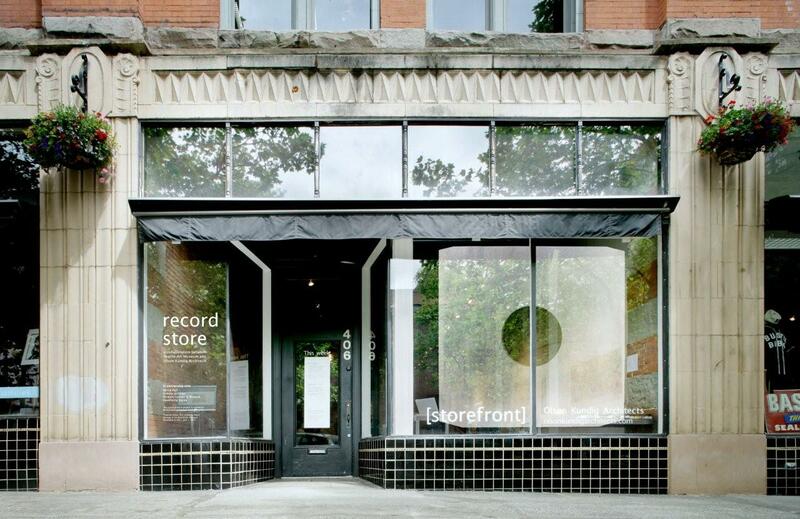 Afterwards, as we toured our office (including our [storefront] space), Sandra mentioned an idea she had for a vinyl record store, or what she calls a “storefront of ideas,” where the public could be invited to curator-led listening parties centered on a large collection of vinyl records. She talked about it not as a pop-up, which is a popular buzzword these days, but as a social practice project. She imagined it could happen in a space like ours—I thought it was a great idea. After several weeks of email exchanges with the general theme of “Seriously, we should do this,” it morphed into a project. We kicked off the idea at a Thursday crit, Olson Kundig Architects’ weekly ritual where everyone in the office stops working for an hour or two so that we can hold an open design discussion about new projects. Sandra began the crit by describing the concept for the Record Store and the upcoming Theaster Gates exhibition at SAM. It quickly became clear that talking about vinyl records—the act of playing and listening to them—and record stores was a bit like discussing religion or politics: people had STRONG opinions. Our staff came prepared with sketches, models and many ideas, which we discussed and debated for a couple of hours. Of the many ideas we generated, the concept that resonated most came from Sandra: “What if there is no audience?” And, in this case, what happens if visitors actively engage the collection? The answer to these questions turned out to be a record shop that could adapt and change—not only to visitors but to a broad range of multiple (and sometimes dueling) curators that Sandra was lining up. Record Store is located just off of South Jackson Street—a zone where American soldiers were forbidden to enter during the World War II era because it was perceived to be “dangerous” due to the “illicit consumption of alcohol.” In reality, it was home to black music clubs and hangouts where the Seattle music scene thrived. So, while in truth Record Store is a misnomer—no records are actually for sale—it is a nod to the decades in Seattle’s history when people gathered in Pioneer Square to create and listen to music. Because we didn’t have much of a budget, we needed to rely on volunteers and donated materials to meet the design/build challenge: Sandra secured thousands of vinyl records from local record collector Bernie Hall, Hawthore Stereo agreed to donate stereo equipment and record players, and Mike Monda of Krekow Jennings (a Seattle construction firm) joined our team to provide construction supervision. Over the past week, members of Mike’s firm joined architects from our office who have volunteered to build out the installation with materials donated by Pinnacle Lumber and Plywood in Tacoma. Blair Payson, [storefront] co-coordinator and architect from our firm, shepherded the implementation of the project and Kristen Becker, also an architect from our firm, developed the window graphic design. This is one of those projects where the final outcome is unknown—it’s a genuine experiment—but we are intrigued by Sandra’s idea that vinyl records can be a catalyst and tool that people work with in order to understand other narratives and perspectives. We are also intrigued by the idea of bringing people together around the culture of vinyl records and record players. About: [storefront] Olson Kundig Architects is an experimental work space focusing on the firm’s collaborations, community projects, research, pro-bono and volunteer efforts, design prototypes, and exhibits/installations.